Today is the birthday of Josephine Sabel (nee Domingue, 1866-1945). A native of Lawrence, Massachusetts, she performed in vaudeville (and the music halls of Europe) from the ’80s through the early twentieth century, traveling with her manager/husband David Sabel. 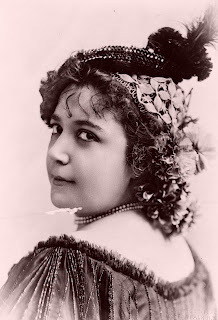 Billed as “the Queen of Song”, tunes she was associated with included “Somebody Loves Me”, “Hot Time in the Old Town”, “Bicycle Built for Two” and “Sidewalks of New York”. Late in her career she had a good run on Broadway with spots in Earl Carroll’s Vanities (1925), Oh, Please (1926) and Sidewalks of New York (1927-28). After this of course Broadway work dried up with the Depression and vaudeville passed from the scene. She passed away in 1945 at the Percy Williams Home for Actors. Next Dante the Magician: Sim Sala Bim!